, an eminent Spanish history and portrait painter, was born at Seville in 1594, and was at first the pupil of Francis Herrera, and afterwards of Pacheco, in whose school his progress was remarkable, and he soon gave manifest proofs of his abilities. He studied diligently alter nature, and painted birds, beasts, fishes, ana landscapes) as they occurred, and designed them with such truth and exactness, that his performances rose into high esteem. His most favourite subjects, at first, were taverns, kitchens, conversations, and persons feasting; and those he executed with a bold pencil, and uncommon tints of colour, in a style peculiar to himself. But at length the sight of some pictures of the Italian masters inspired Velasquez with nobler ideas; and being particularly charmed with the colouring of Caravaggio, he made him his model, and his success in that" style answered his most sanguine expectations. Having spent five years under I ajheco, he- went to Madrid, where he received great encouragement, and had an opportunity of improving himself still more by viewing the paintings in that city. There also he procured the patronage of the duke d’Olivarez, favourite of Philip IV. ; and the portrait which he painted of that grandee obtained him, | the royal favour, in consequence of which he was appointed principal painter to the king of Spain, with an honourable pension, and an apartment in the palace. While in that station, Rubens arrived in Spain; and having visited Velasqnez, and considered his works, recommended it to him to spend some time in Italy. 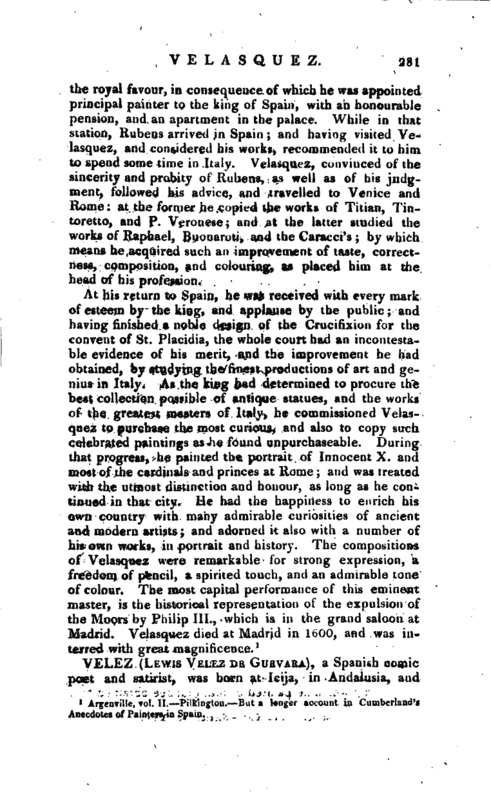 Velasquez, convinced of the sincerity and probity of Rubens, as well as of his judgment, followed his advice, and travelled to Venice and Rome: at the former he copied the works of Titian, Tintoretto, and P. Veronese; and at the latter studied the works of Raphael, Buonaroti, and the Caracci’s; by which means he acquired such an improvement of taste, correctness, composition, and colouring, as placed him at the head of his profession. 1 Argenville, vol. II. Pilkington. 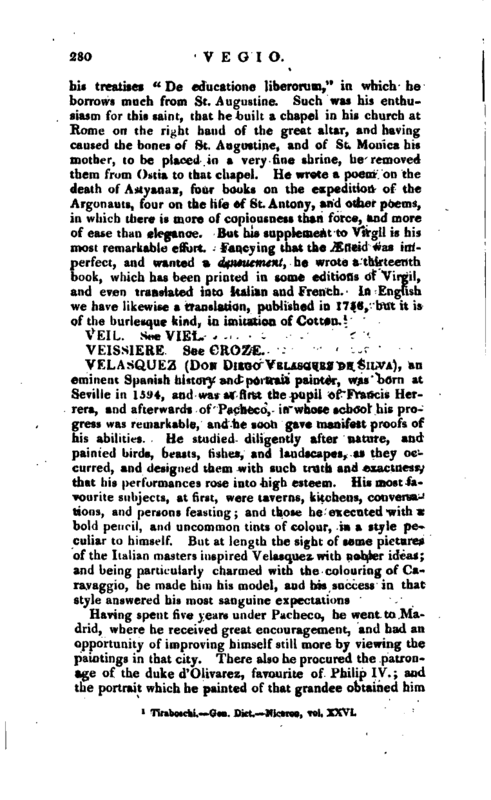 But a longer account in Cumberland’s Anecdotes of Painters in Spain.